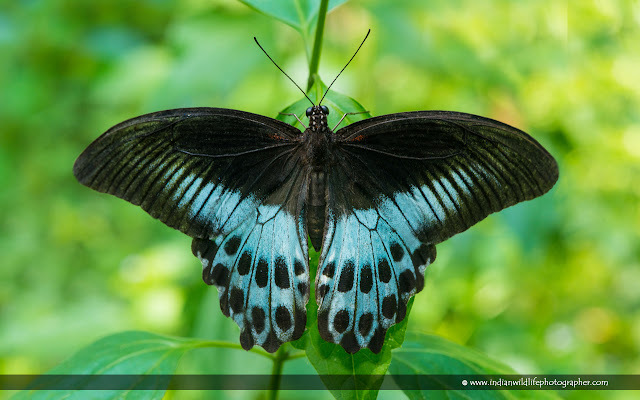 The blue Mormon (Papilio polymnestor) is a large swallowtail butterfly found in South India and Sri Lanka. 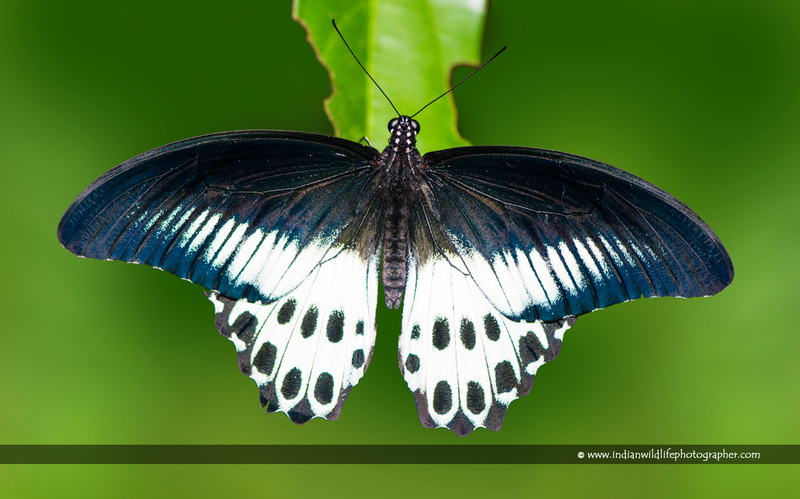 It has a status of ‘State butterfly’ in the Indian state of Maharashtra. Males have the upper wings rich velvety black. The fore wing has a postdiscal band composed of internervular broad blue streaks gradually shortened and obsolescent anteriorly, not extended beyond interspace 6. The hindwing has the terminal three-fourths beyond a line crossing the apical third of the cell pale blue, or greyish blue, with superposed postdiscal, subterminal and terminal series of black spots—the postdiscal spots elongate, inwardly conical; the subterminal oval, placed in the interspaces, the terminal irregular, placed along the apices of the veins and anteriorly coalescing more or less with the subterminal spots. The underside is black with and on the base of the cell in the fore wing is an elongate spot of dark red; the postdiscal transverse series of streaks as on the upperside but grey tinged with ochraceous and extended right up to the costa; in some specimens similar but narrow streaks also in the cell. Hind wing with five irregular small patches of red at base, the outer three-fourths of the wing grey touched with ochraceous, but generally narrower than the blue on the upperside; the inner margin of the grey area crosses the wing beyond the cell; the post-discal and subterminal black spots as on the upperside. In some specimens this grey area is greatly restricted, its inner margin crossing the wing well beyond the apex of the cell; the subterminal spots merged completely with the terminal spots and form a comparatively broad terminal black band. Antennae, head, thorax and abdomen blackish brown. Female very similar but the inter-nervular streaks on the fore wing paler, extended into the cell both on the upper and undersides. Hind wing: the pale blue area on the upperside and the corresponding grey area on the underside paler. In some specimens there is a diffuse short crimson streak at the base of the cell of the fore wing on the upperside. Endemic to India and Sri Lanka. In India it is restricted to the Western Ghats, Southern India and the East coast. It has been recorded as far north as Gujarat. It is often seen even in the gardens and sometimes in the middle of busy traffic in large cities such as Mumbai, Pune and Bangalore. Wynter-Blyth recorded it in Madhya Pradesh, Jharkhand, West Bengal and Sikkim. Your photographs and the perfect description with them is really helping me a lot in the collection which I am making on some native wildlife animals. Thanks for providing these pics.